From Inside is the story of a pregnant woman on a train traveling through an apocalyptic landscape. Obviously, I had to pick a good train. I chose the 20th Century Ltd. I like the name of the train - it sounds like a future that never happened. What I like most about the train, though, is its engine. The J3 Hudson. The J3 Hudson pulled the 20th Century Ltd. from Chicago to New york in the late 1930's - 40's. This is the steam engine that always comes to mind when you think of the golden age of train travel. It is a beautiful machine. ...and if you're making a film about birth on a train, there is no other more aptly-shaped engine. 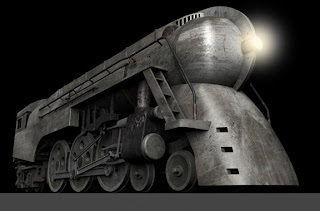 The train was built in Maya, using photographic reference and by studying these amazing models. The most helpful resource was a set of blueprints supplied to me by the New York Central System Historical Society. The model I built is not to the exact specifications of the blueprints or photo reference. Concept paintings and sketches made by the engine's designer, Henry Dreyfus, show an engine that has more graceful and exaggerated lines compared to the engine that was actually built. The From Inside engine is a blend of the designer's concept art and the actual, manufactured engine. I also added parts from other engines for a used, retro-fitted look... as though the engineers have made repairs with whatever spare parts they could salvage. Click HERE to see a short quicktime movie of the first animation I did with the train. Nothing fancy. No textures or smoke. It was a simple test to check the math of the wheel animation. Math? Yep: N=360x(D/(6.28xR)).